The Romans lived in Italy, in a city called Rome. Rome still exists today, and it is the capital of Italy. They had a big impact on how we live our lives today, and gave us things like ways to get clean water, ways to build roads and even the basis of our language. Britain was even part of the Roman Empire for a while, so a lot of the things that Romans did stuck with us. Legend has it that Rome was founded by Romulus, the son of a god, in 753 BC. The Romans spoke Latin, a language that is the basis for other languages spoken today – even English! Romans decorated floors and walls in mosaics, which were pictures made from small pieces of coloured tiles. The calendar that we use today was based on something Julius Caesar made. 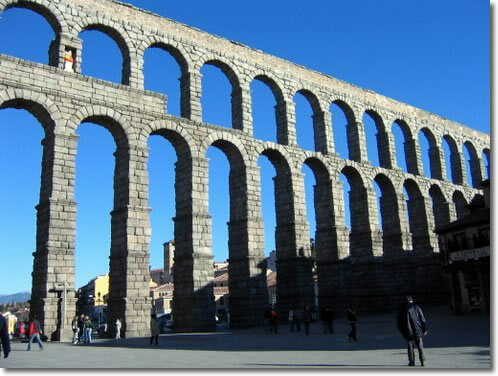 We have the Romans to thank for sanitation – they created aqueducts that kept water clean as it got to peoples’ homes. As a way to relax and have fun, the Romans would to go the Colosseum to see plays and watch gladiator fights. The Romans were so good at building roads, that some still exist today! Romans wore togas, which were long pieces of cloth that they draped around their waist and shoulders. 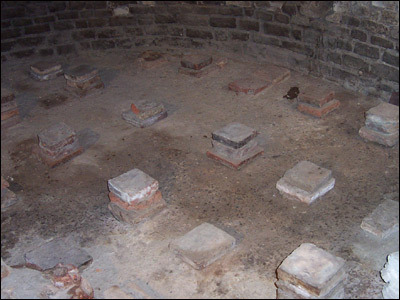 Bath houses were used by everyone to take a bath, have a massage and chat to friends. The Romans used different letters to represent numbers – we call these Roman numerals, and we still use them sometimes today. The Romans had quite a story to explain how the city began. They said that the god Mars or Hercules had twin boys named Romulus and Remus, but that these boys were raised by a mummy wolf. When they were older, they wanted to create their own city but couldn’t agree where. They ended up fighting so badly that Romulus killed Remus, which meant that only Romulus went on to rule the city, which he named Rome (which sounds a bit like Romulus). Rome was built near the Tiber River, which is the third longest river in Italy. If you wanted to look your best in Rome, you’d need to wear a toga. 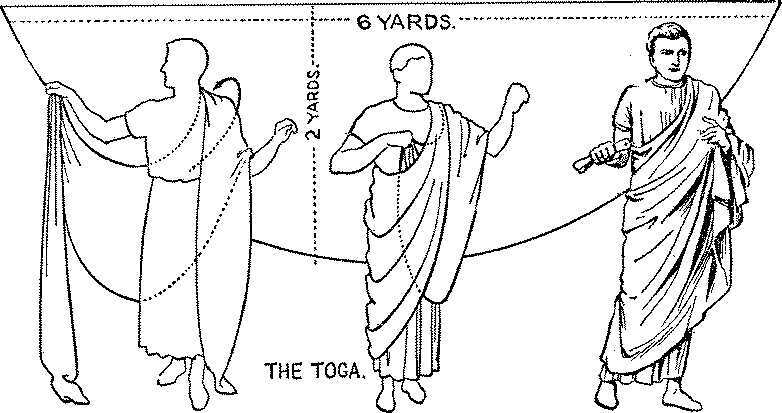 A toga was a long piece of cloth that men would wrap around themselves. Underneath the toga, people just wore plain tunics. The numbers that Romans used look very different from the numbers we use. They counted using a sort of code of letters – I stands for 1, II stands for 2 and III stands for three. It gets more complicated after that – V stands for 5, and the number 4 in Roman numerals is IV. This means 5 minus 1, which equals 4. The way we set up our calendar is like the calendar that the Romans used. Julius Caesar made a calendar based on 365 days in a year, and 366 days in leap years. The Romans spoke a language called Latin. While nobody speaks Latin anymore, lots of languages we speak today are at least partly based on Latin words – even English! The Romans all went to the same place to take baths – these were called bath houses. They would be decorated in pretty mosaics, and have hot and cold water so people could wash properly. People could get a massage there if they wanted, play sports, and even stay a while to chat with friends. In 79 AD, a volcano called Mount Vesuvius erupted in one of the most famous explosions in history. The ash that came out of the volcano buried two cities – Pompeii and Herculaneum. These cities weren’t uncovered until 1,700 years later! There were three main groups of people in Rome (called orders) – the plebeians (plebs), equestrians and patricians. equestrians – people who were rich and successful, but weren’t born into patrician families. You had to own a certain amount of property to become an equestrian. If you had to make a road, what would you do? The Romans knew exactly what to do. they made sure their roads were straight and even. In fact, Roman roads were so good that some are still around today! When they built roads, they started by digging a long hole that they’d fill up with different layers of rocks and dirt. They also made sure that water had a place to go when it rained, which kept the road in good condition. When the Romans wanted to have fun, they’d go to the Colosseum to watch gladiators fight or to see plays. You can still see the Colosseum in Rome – it’s not exactly like it was back in Roman times, but you can get an idea of how impressive it would have been back then. The Colosseum was first called the Flavian Amphitheatre. It is shaped like an oval, and is called an amphitheatre because it doesn’t have a roof. Chariot races weren’t held at the Colosseum – people would go to the Circus Maximus for that. It was as long as about six football pitches put together, and it had two rounded ends where the chariots would turn to complete another lap. In big cities, sometimes there isn’t enough water in nearby lakes and rivers for everyone to get what they need to cook and clean. The Romans solved this problem by inventing aqueducts that carried water from sources that were farther away from the city, making sure that everyone in the city was able to get fresh water delivered straight to them. Aqueducts are long lines of grooves that water could run along, and they were built high in the air to make sure the water stayed clean. You can still see some Roman aqueducts around today. 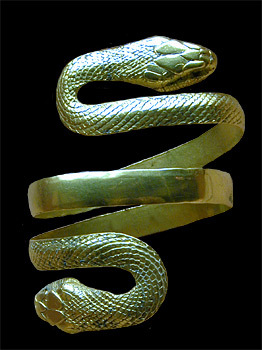 Virgil (70-19 BC) – Virgil was a famous Roman poet who wrote the Aeneid, an epic poem about a prince called Aeneas. Claudius (10 BC-54 AD) – Claudius was the fourth Roman Emperor and led the Roman army that conquered Britain. Cicero (106-43 BC) – Cicero was a famous Roman orator, which means he was known for giving good speeches. He could write well, and could also speak well in public. He is also known for being a philosopher. Pliny the Younger (61-112 AD) – Pliny the Younger wrote many letters about the life and times he lived in, which have helped us understand more about Rome and the things that happened then. Pliny lived during the eruption of Mount Vesuvius, which killed his uncle, Pliny the Elder. Try your hand at some Roman ball games! Get a gladiator's view of the Colosseum and immerse yourself in the action! You can also read adventure stories set in ancient Rome; three recommended series are Roman Brit, Dorkius Maximus and Jeremy Strong's Romans on the Rampage, or look through our complete list of great kids' fiction books about Ancient Rome. Read about the bath house in Rome then take a virtual tour through a Roman bath house or fly over one! See the spas of the ancient world – visit real Roman baths! The Museum of London has exhibits about the time when Britain was a part of Rome, and when the Romans lived in London. Go to the British Museum to see some Roman mosaics from the time when Britain was part of the Roman Empire. Walk around a Roman villa. Explore the Roman city of Verulamium on the site of the modern city of St Albans, in Hertfordshire.